Congratulations to Sanjay Purushotham and Pang-Chang (Brian) Lan, who passed their defense last week! Following are their thesis abstracts and they also shared their PhD experiences. In this thesis, advanced machine learning techniques are developed to tackle challenging problems arising in three Big Data application domains. They are: 1) partial near-duplicate content copy detection and alignment for the multimedia (video) application, 2) personalized single user and group recommender systems for the social media data application, and 3) sparse learning models for identification of discriminative feature interactions for gene expression prediction and cancer stage classification for the biomedical data application. Novel and suitable machine learning algorithms and models are designed to meet the nature of the data in each specific application domain. In wireless communication systems such as LTE, information security is protected by symmetric cryptography which assumes that the user and the base station shares the same secret key. But before the setup of the symmetric cryptosystems, the key sharing and authentication processes are vulnerable to eavesdropping. This is referred to as the secure initiation problem. Our work proposes to use physical layer techniques to achieve perfect secrecy without using cryptography, so the secure initiation problem can be solved. In particular, we bring up the concept of having only channel state information (CSI) at the transmitter side but not at the receiver nor the eavesdropper. This concept will be shown beneficial in secrecy comparing to the conventional assumption of full CSI at all terminals. A practical scheme, unitary modulation, is then proposed to exploit this concept. We show the good performance of the unitary modulation scheme in terms of secrecy and reliability. PhD journey is a unique time in an academic’s life. It teaches one to become more self-reliant and develops confidence to challenge the status-quo. During my PhD, I learned a lot about research, leadership, team-work and life (in-general) by being a part of Media Communications Lab (MCL). Prof. C.-C. Jay Kuo is an excellent mentor and he shared his wisdom, pushed me to work hard, and gave me freedom to collaborate with other researchers and explore diverse set of research topics. 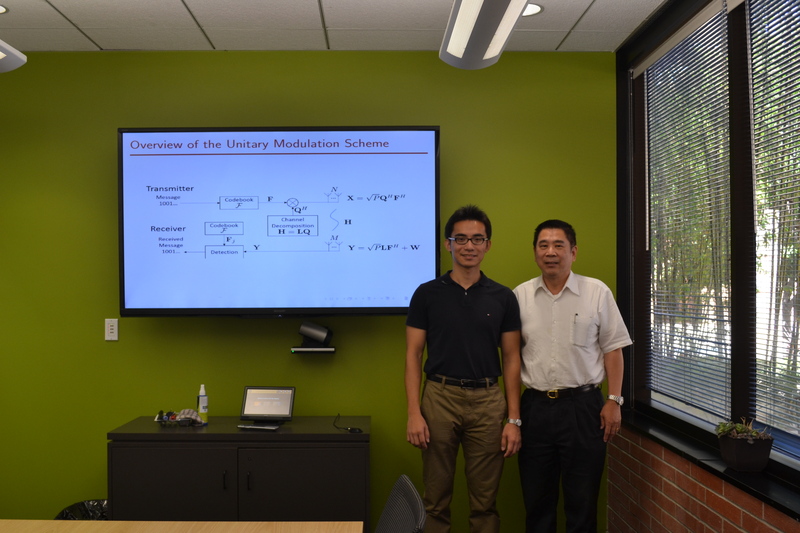 I thank Prof. Kuo and my fellow MCL members for simulating discussions, fun times and memorable experience during my PhD study at USC. Time flies. I still remember the first time I got here. Everything was so strange to me. After these years, I got more and more used to the environment. To me, it was a great decision to study abroad. I saw attitudes in the US, that is, do everything to one’s best. I worked with so many talented people here. Most importantly, I observed how large the world is. From research, I learned how to solve problems by myself. From presentation, I became better in expressing my ideas in an understandable way. Being a doctor is not the end. Rather, it is a start of learning for life. Remember. The value of a person is not on how fast one can run but on whether one can run to the last second.